And then I made pie. Fresh Strawberry Pie! 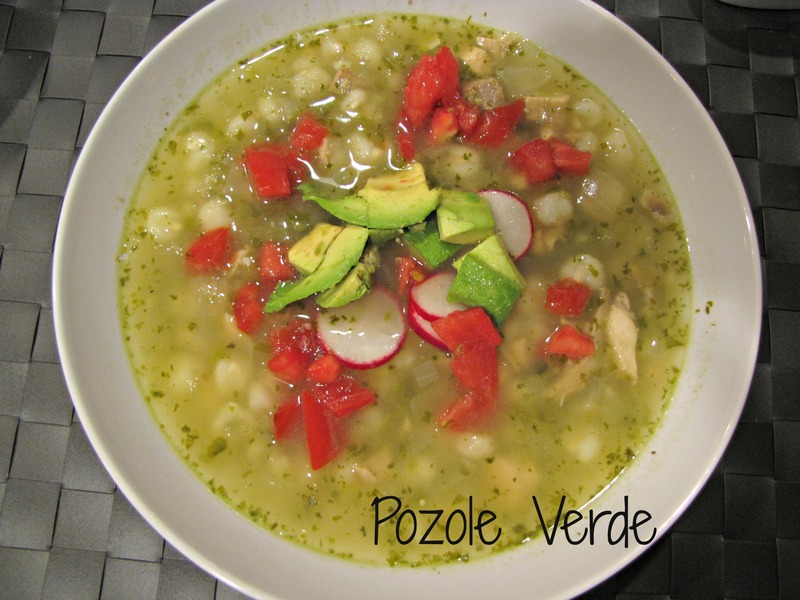 This recipe comes from my friend Carrie in Minnesota who expertly knows her way around the oboe, around the kitchen, around the garden, and especially around pies! This is a pretty simple recipe relying on the abundant flavor of super fresh berries for all the pizzaz of a fancy dessert. 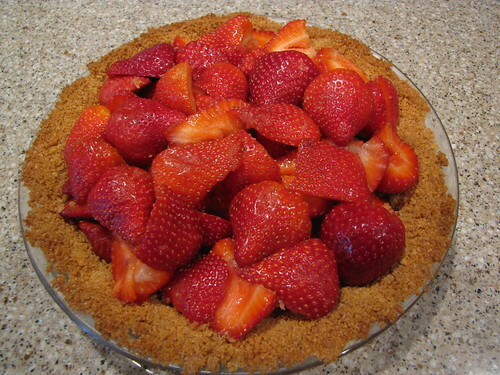 Other than the graham cracker pie crust, there is no baking…just let the strawberries do their thing. 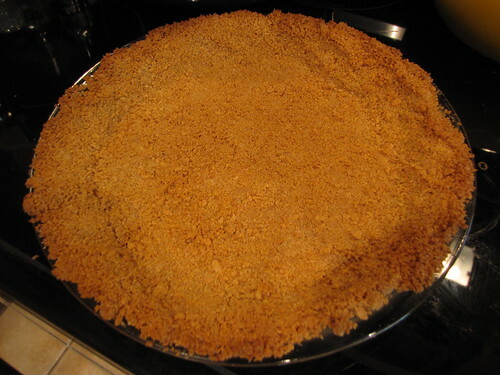 Graham Cracker Pie Crusts are very easy to make. 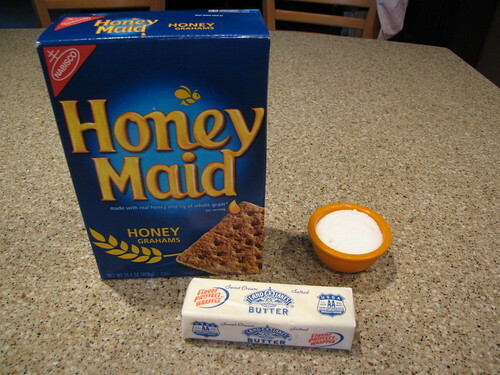 All you need are Graham Crackers, Sugar, and Butter. I’m a big fan of homemade crusts, but I’m also not so picky that I will let the crust keep me from making pie. 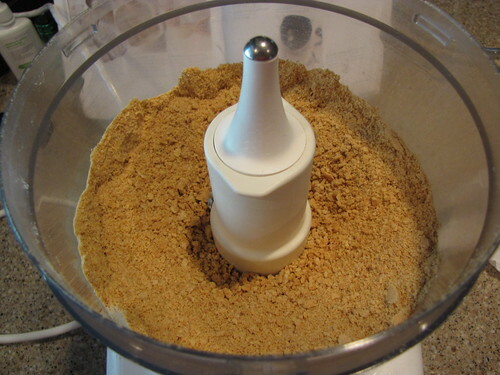 If you don’t have the time or love for making your own crust, buy a good quality pre-made graham cracker crust at the store and go from there. 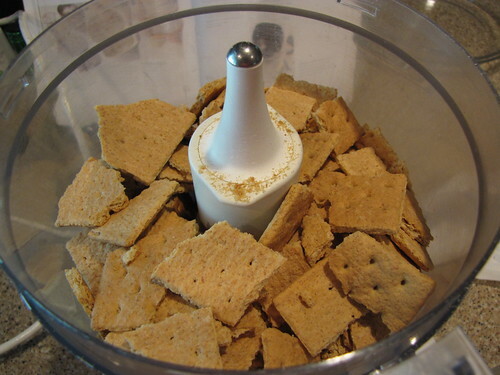 For the homemade variety, crush 10 full sheets of graham crackers in a food processor. You can also crush the crackers by hand by putting them in a ziplock bag and rolling them with a rolling pin or big heavy can. Whatever method you choose, just be sure to get the crumbs into tiny little pieces. 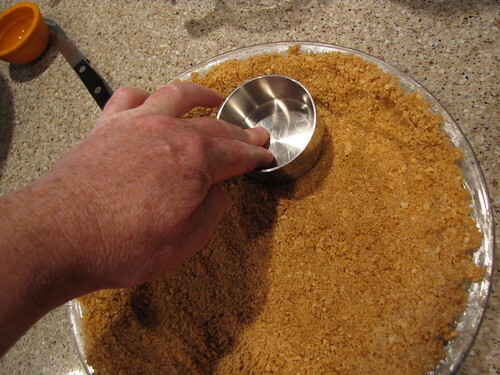 You can also buy the graham cracker crumbs in the store but for the money, it’s much less expensive to make your own crumbs. Plus you’ll have leftover graham crackers for snacking. I won’t tell anyone if you also happen to buy nutella to spread on them. 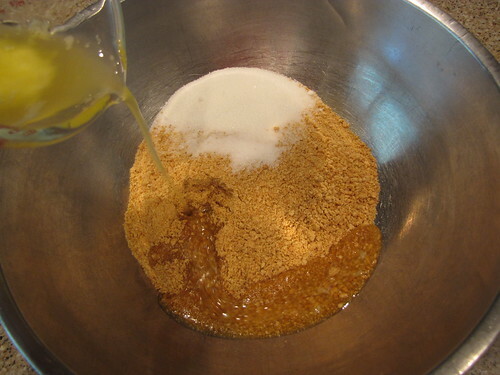 Melt 6 Tablespoons (3/4 of a stick) of butter and add it to the crushed graham cracker crumbs. Add 3 Tablespoons of sugar and give it a stir to combine. 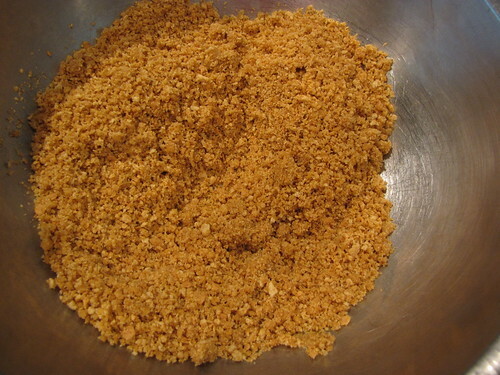 The crumbs, butter, and sugar should come together to have the texture of wet sand. Use a little of the leftover butter to grease a 9 inch pie pan. 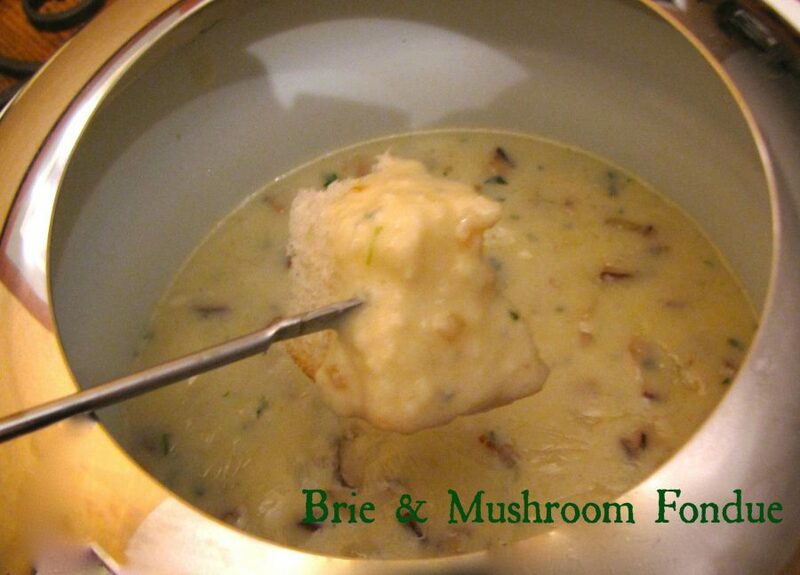 Pour the crumbs into the buttered pan and press them onto the bottom and up the sides with your fingers. 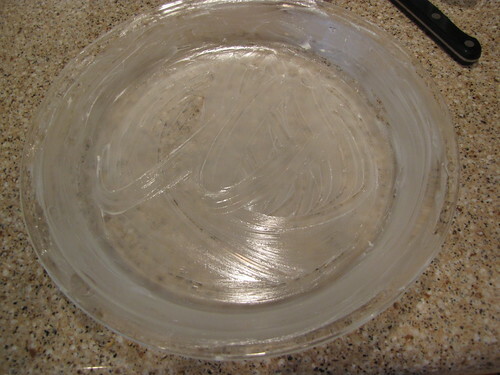 You can also use the bottom of a small measuring cup to get a smooth surface. This trick works really well if you are making cheese cake and trying to get the crumbs up the side of a spring form pan. For this pie, I mostly just used my fingers. Bake the pie crust at 375 degrees for 10 minutes until very slightly golden brown. Cool the crust completely on a wire rack. 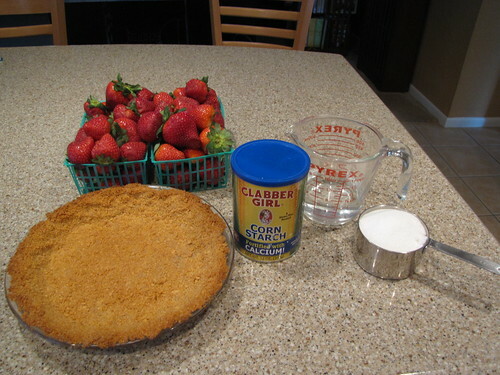 For this pie, you’ll need whole strawberries for pie and also chopped strawberries for the sauce – about 3 pints total. Pick the nicest looking berries in the bunch for the pie, remove the stems, and use a small sharp knife to remove the hull or little tough part right under the stem. Any berries that don’t look so great are good candidates for the sauce. 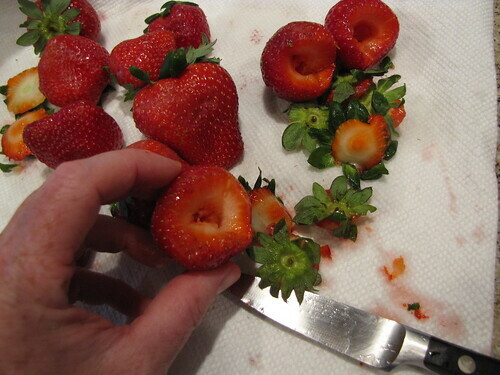 Remove the stems and hulls from 2 cups of berries and cut them into quarters. Add them to a pot with 3/4 cup of sugar. Bring these chopped berries to a boil over medium high heat. 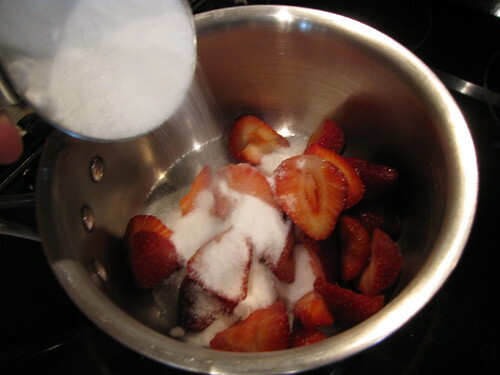 Use the back of the spoon or a potato masher to break the strawberries apart as they cook with the sugar. 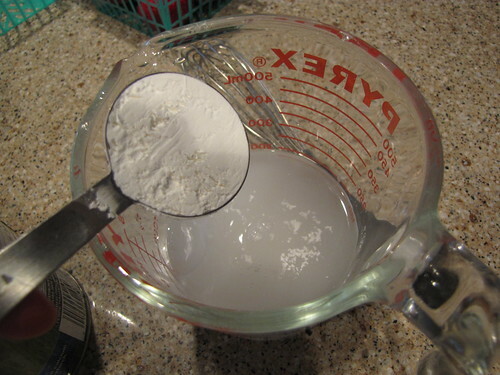 Add 3 Tablespoons of cornstarch to 3/4 cup of water and whisk to blend and remove any lumps. 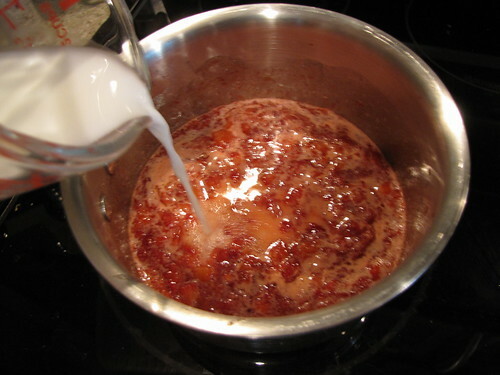 When the berries are boiling and have been mashed, stir in the cornstarch mixture. 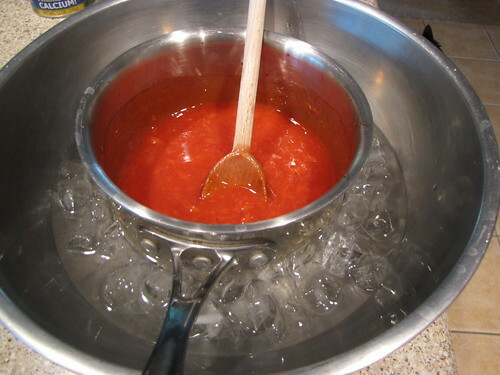 Bring the sauce back up to a boil so that it will thicken. Stir constantly to keep it from sticking or scorching. 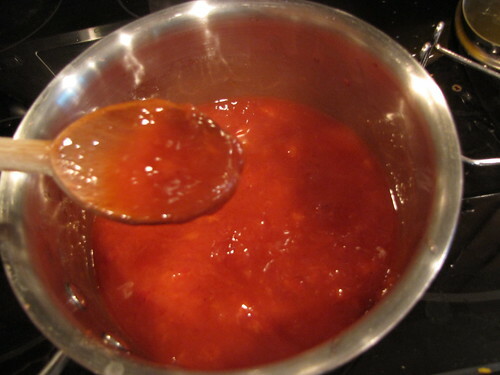 When the strawberry sauce is nice and thick, remove it from the heat and allow it to cool. Back to the pie! If you have really small berries, leave them whole and fill up the crust. If your strawberries are larger, cut them in half or quarters and load them into the cooled crust. The strawberry sauce needs to be slightly cool. You can wait it out, or you can speed things along by making a little ice water bath for the pot. When the sauce has cooled a bit – it doesn’t have to be cold, just not boiling hot anymore – carefully spoon it over the berries. Notice I used the words carefully and spoon. That is because all of my strawberry sauce came rushing out of the pan in one giant glob. It went into the pie shell and all over the counter and on to the floor. Because of my sauce overflow, my pie doesn’t look so pretty, but it sure tasted great. Food stylist, I am not. 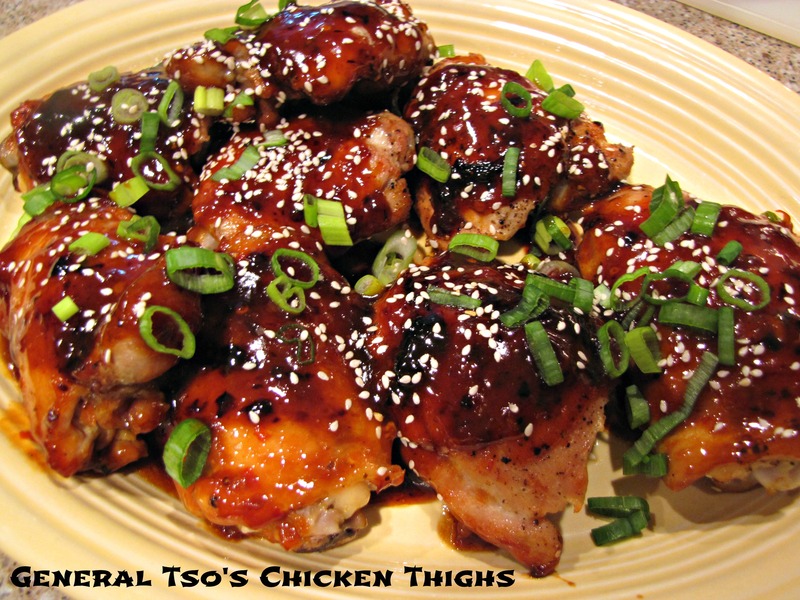 The next time I make this, I will probably use a little less sauce. 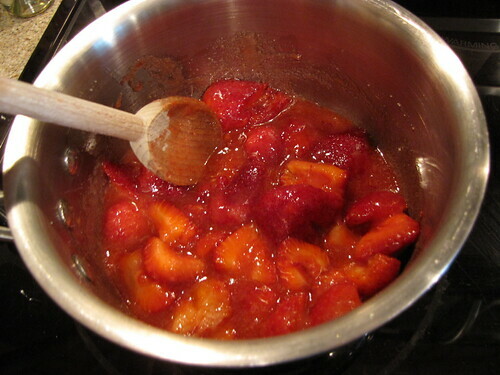 Any leftover strawberry sauce can be put to good use on biscuits or vanilla ice cream. I am also considering mixing the sauce and berries together before adding them to the crust. That would probably make for a little nicer presentation and you can control the amount of sauce you use a little easier. Put the pie in the refrigerator until completely chilled – at least 2 hours. Top with some whipped cream and dig in! Valentine’s Day is Thursday. 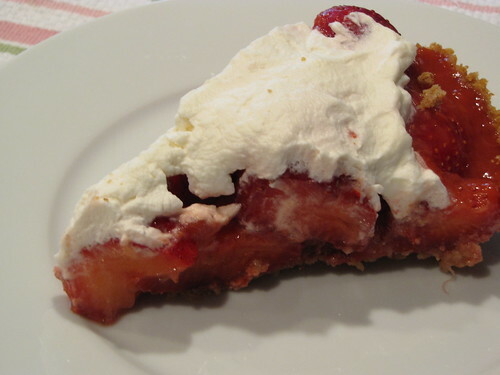 Make some fresh strawberry pie for your sweetie! 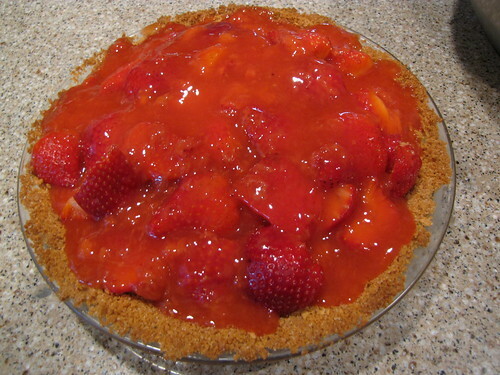 I am now craving fresh strawberries and fresh strawberry pie. I can’t wait to eat fresh strawberries ! 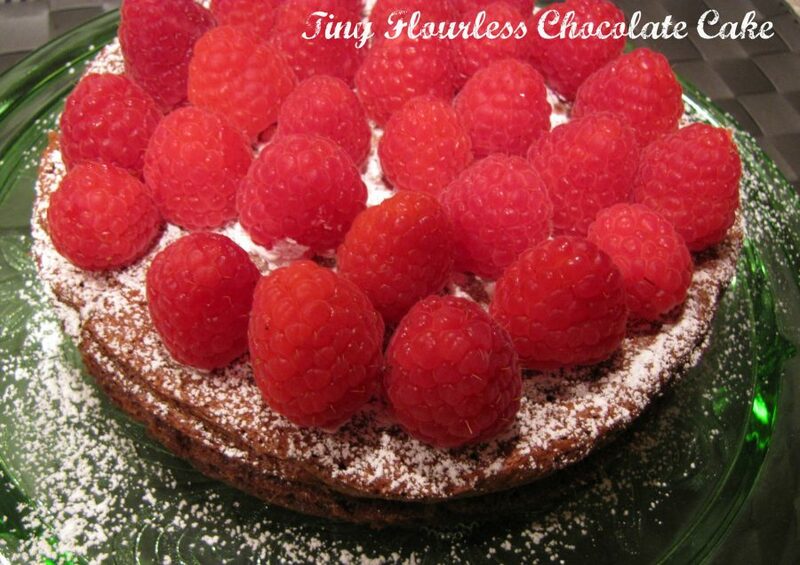 This pie looks absolutely fabulous !